The next season, 1915, finds optimism abounding in St. Louis for another good season. Early in the year, pitcher Lee “Specs” Meadows becomes the first major leaguer to wear his eyeglasses regularly. 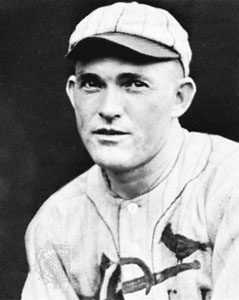 Rogers Hornsby makes his major league debut on September 10 and goes hitless in two at-bats (BOXSCORE). Four days later he makes his first start and is headed for a Hall of Fame career. Not before he has a not so spectacular season batting .256. He works on his uncle’s farm and gains almost 25-30 lbs which seemed to help. The team completes the year in sixth place and is 72-81 and 18.5 games behind the pennant-winning Philadelphia Phillies. One odd note from the season happened on August 30th when the Cardinals lost in the 10th inning after a flyball hit by “Possum” Whitted of the Phillies bounced off the wall, hit the left fielder (Bob Bescher) in the chest and bounded over the wall for a home run.